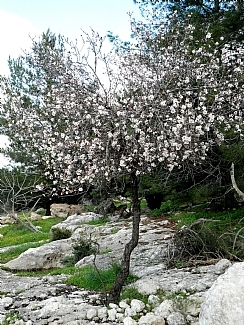 When the almond tree blossoms, let us celebrate the festival of trees through a tour of the village of Lifta, on the outskirts of Jerusalem. For hundreds of years the <?xml:namespace prefix = st1 ns = "urn:schemas-microsoft-com:office:smarttags" />village of Lifta graced the entrance to Jerusalem, across the pastoral panorama of the Jerusalem hills. Village life surrounded one central spring. Hundreds of years ago, an aqueduct was dug in the ground in order to increase water flow and allow irrigation. Since then Lifta has undergone many changes and upheavals, yet the site maintained its special charm by the entrance to the city. Let us set forth on a tour tracing the history, plant life, and water of Lifta, adorned during Tu Bishvat by the glorious blossoms of the almond tree.